When I found these cute felt ice cream cones in the Target Dollar spot, I grabbed them immediately. It was a ready to go counting activity and it was super cute, too. 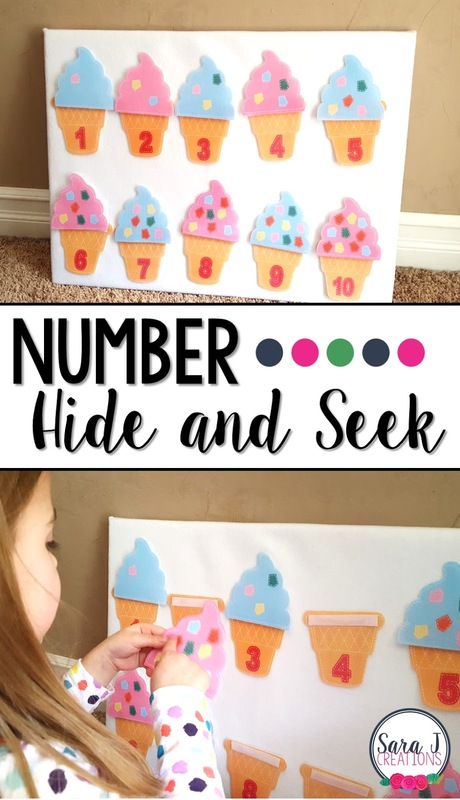 I decided to turn it into a counting game, but also a game of hide and seek for my girls. I took our felt board (you can find our directions here) and set the cones with the numbers on it. Felt sticks to felt so there is nothing on the back of these. They did include velcro to help the tops and bottoms stick a little better. Then I hid the tops all around our family room. Because of that strip of velcro, I got them to stick to the couches, ottoman, carpet, Christmas stockings, dog bed and more. Once I had them all "hidden," I had the girls come back into the room and search for the ice cream. Once they found the top, they had to count the sprinkles and find the matching number. Then they could stick it onto the cone that matched. My almost 5 year old loved this and did great with it. I had to get her to slow down her counting a few times and point to each sprinkle so she got the correct answer. Little Sister doesn't really know her numbers yet so she practiced pointing and counting the sprinkles and then I would help her find the corresponding number on the cone. They wanted to play this three or four times in a row. We took turns hiding the ice cream, finding it, counting the sprinkles and matching the top and bottom of the ice cream cone. This set was $3 in the Target Dollar Spot. If you don't have this exact set, don't worry, I have some options for you. -You could buy a pack of felt and draw the ice cream cones with the sprinkles and matching numbers and cut them out. -You could even make these out of cardstock or paper (I would laminate for durability) and stick velcro on the back so you can still use it on a felt board and stick the pieces around the room. Even if you don't have the exact set, you can still try one of the other options for some cute counting fun. What is important is that your children are practicing counting and learning numbers 1-10.